The Philadelphia Eagles traded their first pick of the 2018 draft (as well as a fourth rounder) to the Baltimore Ravens in exchange for three picks. For more on this story, click here. The Philadelphia Eagles have reworked the contract for quarterback Nick Foles. For more on this story, click here. 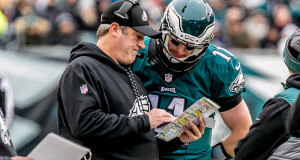 Philadelphia Eagles quarterback Carson Wentz and head coach Doug Pederson are reportedly set to appear in a new TV show involving former quarterback Ron Jaworski. For more on this story, click here. Eagles Add LB Paul Worrilow and TE Richard Rodgers. The Philadelphia Eagles have agreed to terms with linebacker Paul Worrilow and tight end Richard Rodgers. For more on this story, click here. 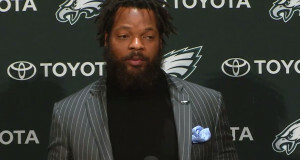 Newly acquired Philadelphia Eagle defensive end Michael Bennett is being sought by Texas police in connection with an incident that allegedly occurred during the Atlanta-New England Super Bowl. For more on this story, click here. The Philadelphia Eagles have agreed to terms with former Baltimore Ravens and Pittsburgh Steeler wide receiver Mike Wallace on a one-year contract. For more on this story, click here. Click here for continuing news on signings and releases by the Philadelphia Eagles and other NFL teams. The Philadelphia Eagles continue to make tweaks to their Super Bowl-winning roster, this time sending wide receiver Torrey Smith to the Carolina Panthers in exchange for cornerback Daryl Worley. For more on this story, click here. The Philadelphia Eagles are not standing pat following their Super Bowl championship, as evidenced by their reported trade with the Seattle Seahawks for defensive end Michael Bennett. For more on this story, click here.